The Olympic Peninsula is perfect bigfoot habitat. Washington’s Olympic Peninsula is one of my favorite places to go bigfooting. Its thick rain forests, steep terrain, and abundant food supply make it one of, if not the best bigfoot habitat in the lower 48 states. Few people live on the peninsula, especially its north and west sides, but yet many bigfoot reports continue to come out of the area year after year. I have been to the Peninsula on many occasions, and have had some interesting things occur on these trips. 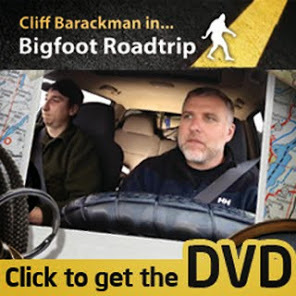 However, unlike Bobo and Matt, I cannot claim to have had bigfoot action on nearly every expedition. I have spent many dark cold nights alone in this vast rainforest listening to the sounds of silence. That’s bigfooting for you. It was a recording obtained by Tyler Bounds along the Humptulips River while on a lengthy expedition that brought us to the Olympic Peninsula. This recording may not sound as dramatic as our description might lead you to believe, but any seasoned bigfooter knows that recordings always far fall short of hearing those sounds live in person. Despite this, Tyler has been kind enough to allow me to share his audio recordings in this report. To hear Tyler's recording, see footprint photos and analyses, and to read more about this expedition, click here. Hope you can take the time to read it!